Sauda offers a variety of activities. There is something for everyone: golf, paddling, cycling, Zumba etc. 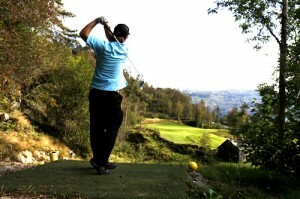 Sauda Golf Club’s golfcourse at Grønsdal was finished in 2008. The 9-hole golf course is centrally located and is just outside Sauda City Centre. Close to the boat harbor, paths in the woods, overnighting places and bathing/ swimming areas, the golf-course is unique in Rogaland. Imagine a spring day with landscape views of the fjord, over the green hills and not forgetting snow-peaked mountains such as Hovlandsnuten and Reinsnuten reaching for the blue sky. Sauda Ferie & Fritid has 10 brand-new bicycles for rent at the tourist office. The bicycles are equipped with tyres which are suitable for use on both tarred and gravel roads, and also shock absorbers which can lock when necessary. Rental costs Kr 150 +deposit of Kr 100 per person, per day (including helmet and lock). It is the renter’s responsibility to return the equipment in same condition as when rented. Ask us for advice for good cycling paths in and around Sauda. By request, we can also offer a guide on these trips (two weeks advance booking). Sauda Ferie & Fritid can on occasion, pick up and drop off cyclists, hikers etc. This extra service costs Kr 200. 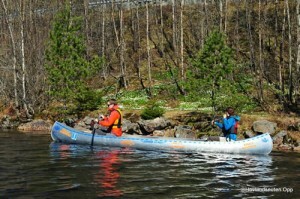 Sauda Ferie & Fritid has two canoes for rent at Vetrhusvatnet, an approximately 8 km drive from Sauda City Centre along the eastern side of the fjord. The canoes are locked in their own boathouse. Keys and life vests are available at the tourist office. Frisk & Rask training centre and gym is located in the 2nd floor of Coop Mega building near the city centre. The centre has about 25 spinning cycles, good power-training equipment as well as a variety of training benches, weights and other training equipment. Join in Zumba, Corebar, Step and other group sessions. We have experienced trainers and provide tailored sessions if required.